The barangay of Linawan began as a small village five kilometers north of the town of Anda, formerly known as Quinale. It is nestling at the foot of Kabagni, Manaol and Maanghit mountains with its shoreline facing the sea separating the provinces of Surigao and Leyte. During the old times marine products were in abundance in this place such as fish, seashells and other marine resources abound the shores and the swamps. Dynamite fishing was practically unknown to the villagers in those days. The natives would catch fish by primitive methods yet without much difficulty. This village before and even until now is purely agricultural and as such varied crops like camote, gabi, corn, rice, ube, cassava, bananas, coconuts, taro and many other root crops are raised the year round. According to the old folks, the name linawan comes from the Visayan word “linaw” which means clear, quiet and peaceful place. However, during the later part of the Spanish regime, when the villagers inhabitants could no longer endure the abuses and cruelties of the Spanish authorities in the imposition of the voluntary labor practices, the villagers banded themselves into one solid union and christened their group “Katilingbang Kaliwat ni Maglinti” (KKM). As it can be recalled, any villager that time who would fail to report for voluntary service on a given date for the construction of the adobe churches and other government constructions, would be punished with one cavan of beatings which is equivalent to 25 whips to the naked buttocks of the absentee. If one would touch to feel that part hit by the whip, the whipping would repeated all over again. So, with formation of the Katilingbang Kaliwat ni Maglinti bloody ambuscades were staged against the Guardia Civil every now and then leaving the scenes of the encounters like lakes of blood. Specifically mentioned as the leader of that resistant movement was a certain Cabel Paglinawan, an invincible man, with incredible charm and indomitable spirit. Those lakes of blood the called “linaw” became the password of the KKM members which later on was adapted as the name of this Barangay of “Pagalinawan sa dugo” to mean either a lake of blood or in honor of Cabel “Kublan” Paglinawan. To this writing, nobody from this generation could trace the whereabouts of this man and his family. Fronting the seaport of this barangay is an imposing mound of earth called Pulo or Po in short approximately 75 feet above sea level which is beautifully carved like an inverted vat by an unseen hand of nature to serve as a balcony and/or watchtower for the inhabitants in welcoming their loved ones who are coming home from their fishing ventures and likewise on beckoning the on-coming sailors from the different parts of the Visayas and Mindanao who would like to drop their anchor in port to pass their night. Barangay Linawan was founded on May 2, 1892. Presently, the barangay is composed of three (3) sitios, namely: Mahayahay, Estaca and Amontay. It is also subdivided in to seven (7) puroks. This can be classified as agriculture based economy. More that 80% of the residents are deriving income from fishing and farming. As to transportation, the Linawan proper can be accessible through buses from Tagbilaran City, jeepneys, and other means of transportation like hired motorcycle or habal-habal and tricycle. They are also enjoying adequate supply of water and almost 100% are using electricity even in the upper land areas. Barangay Councilors Annabelle G. Amoguis Carmelo B. Morata Ignacia S. Jandayan Rosita S. Deligero Rommel S. Deligero Victor B. Mantillo Manuel G. Magadan Sr.
SK Kagawads Lorena D. Sumalo Glenda Lyn O. Deligero Marvin S. Deligero Jeanne S. Deligero Joseline Q. Simpao Laurence S. Jandayan Elpedio D. Gagbo Jr.
Barangay Treasurer Manuel Magadan Jr.
LINAWAN LITTLE RICE TERRACES – Barangay Linawan has its own version of Mt. Banawe’s Rice Terraces. Although modest in size, they nevertheless form a wondrous sight as they cascade down the valley, giving a scenario of breathtaking country setting. ACACIA TREE – Reputed as one of the oldest tree in Barangay Linawan, this century old tree is significantly located at the Linawan Elementary School. Everyone will surely be mystified with its unusual feeling and its enchanting beauty. SEASIDE HILL & MARINE SANCTUARY – A kiosk located atop seaside hill provides a magnificent view of the sea. 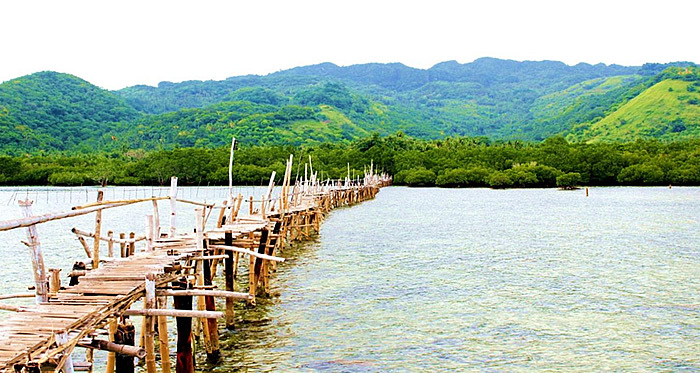 Make-shift wooden bridges connect the hill to a protected sanctuary where marine life abounds. STA. CRUZ FIESTA CELEBRATION – Held every May 2 & 3. The most awaited annual commemoration of the feast day of their patron, Sta. Cruz. This will highlight the grand reunion of balik-linawanhons with several activities being lined up like Grand Discos, Pinoy Games, Nightly Shows, Basketball League, Variety Shows and the Grand Coronation Night of Mr. & Miss Teen Linawan. KASADYA SA PASKO SA LINAWAN AND NEW YEAR’S CELEBRATION – A musical variety show sponsored by the SK-Linawan. The glittering giant Christmas tree in the chapel and the homes and gardens twinkling with the season’s best wishes will surely attract and feel the spirit of yuletide season. TARSIERS – Considered as the smallest primate in the world, tarsius syrichta or Philippine Tarsier can also be often spotted in the tropical forests of Linawan. This creature usually feeds primarily at night on insects and lizards. The primate has well-adapted hind legs for leaping, and has extremely long fingers and toes equipped with fleshy disks for traction. BASKET WEAVING – The number one product of Linawan which Linawan boast of, are their baskets which are made in different sizes with variety of the most intricate designs. These are sought and transmitted elsewhere. NIPA SHINGLES – Linawan’s best seller product is the woven nipa roof. This is widely distributed in the town because of its durability and fine craftsmanship.